Wedelolactone, a compound originally extracted from Eclipta alba, has been shown to inhibit caspase-11, which is a key regulator of proinflammatory cytokine IL-1?? maturation and pathological apoptosis. Bay 65-1942 (R form) is an ATP-competitive inhibitor that selectively targets IKK?? kinase. MLN120B is a potent and effective IKKbeta inhibitor. IKK-2 inhibitor VIII is a potent and selective IKK-2 inhibitor with IC50 of 8.5 nM. IKK-3 Inhibitor is a potent, selective, inhibitor of IKK-epsilon kinase with IC50 of 40 nM; inactive at IKK-alpha and IKK-beta. Bardoxolone methyl, previously known as RTA 402, is the lead molecule in Reata's portfolio of Antioxidant Inflammation Modulators (AIMs). IKK epsilon-IN-1 is a potent IKKε inhibitor; inhibit the in-situ IKK ε-mediated phosphorylation of IRF3 with an IC50 value of less than about 100 nM. Bay 65-1942 is an ATP-competitive inhibitor that selectively targets IKKβ kinase activity. BMS 345541 is a cell-permeable and highly selective IKB kinase (IKK) inhibitor that binds at allosteric site of the enzyme and blocks NF-kB-dependent transcription in mice. Bardoxolone methyl is an orally-available first-in-class synthetic triterpenoid. It is an inducer of the Nrf2 pathway, which can suppress oxidative stress and inflammation. Amlexanox is an anti-inflammatory antiallergic immunomodulator used to treat recurrent aphthous ulcers (canker sores), and (in Japan) several inflammatory conditions. PS-1145 is a highly specific IKB kinase (IKK) inhibitor that efficiently inhibits both basal and induced NF-kB activity in PC cells. BI605906 is a novel inhibitors of the IKK beta. Bay 11-7821 is an irreversible inhibitor of TNF-α-stimulated IκBα phosphorylation. SC-514 is an orally active, ATP-competitive IKKβ inhibitor (IC50 = 3 - 12 μM) that displays > 10-fold selectivity over 28 other kinases including JNK, p38, MK2 and ERK. IKK 16 is a selective IκB kinase (IKK) inhibitor for IKK-2, IKK complex and IKK-1 with IC50 of 40 nM, 70 nM and 200 nM, respectively. IMD 0354 is an inhibitor of IκB kinase-β (IKKβ) that blocks NF-κB nuclear translocation. 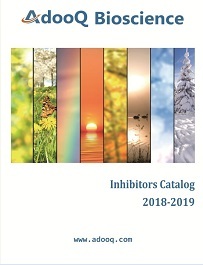 PHA 408 is a potent, highly selective and ATP-competitive IKB kinase-2 (IKK-2) inhibitor (IC50: 40 nM), which binds IKK-2 tightly with a relatively slow off rate; highly recommended tool to investigate the mechanisms by which IKK-2 regulates NF-KB signaling. TPCA-1 is a potent and selective inhibitor of human IκB kinase-2 (IKK-2) with IC50 = 17.9 nM for IKK-2 compared to 400nm for IKK-1.